Adaptations are one of my favorite types of stories to review due to their ability to show one story from multiple perspectives and through the eyes of multiple generations of writers. 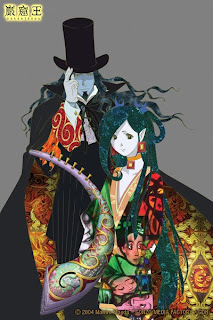 Thus, Gankutsuou, Gonzo's 2004 anime adaptation of Alexandre Dumas' seminal novel The Count of Monte Cristo, is simply irresistible to my sensibilities as both an anime fan and a fan of the original novel. Unlike many others of its ilk, Gankutsuou goes above and beyond slavish imitation, changing a number of relatively important parts of the story from the get-go. Naturally this can confuse most readers of the book as they try to figure out how the plot could possibly work out with all of the changes. When I began watching, I, too, was a skeptic. 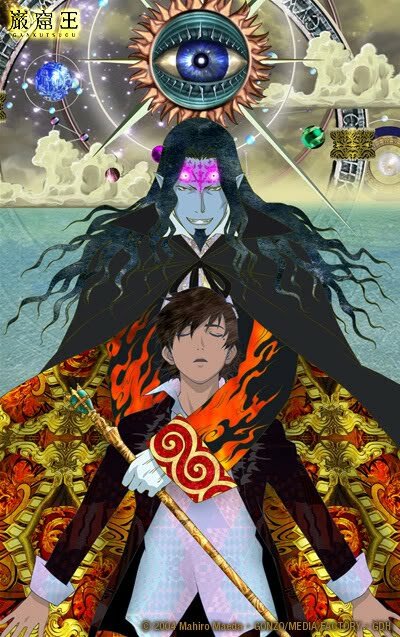 Though I am certainly not a total believer now, the 24 episodes of Gankutsuou: The Count of Monte Cristo have shown me a fascinating approach to adaptation that maintains (and in some cases improves) the depiction of the central theme while not fretting over the nitty-gritty details of the original work. On the topic of omitting grit, Gankutsuou skips Dumas's entire set of introductory chapters, which serve to construct the tragic back-story of the mysterious, fantastically wealthy Count of Monte Cristo. Instead, scriptwriters Natsuko Takahashi (Fullmetal Alchemist, Romeo X Juliet) and Tomohiro Yamashita (Afro Samurai, Red Garden) drop us into the Carnivale on Luna, a strikingly science-fictiony replacement for the original setting of Rome. As if the book purist in me wasn't already crying out at the omission of Edmond Dantes’s/Monte Cristo's unjust 15-year imprisonment, giant CGI blimps and reveling space colonists seem to state immediately that this is not Dumas's original (and, very importantly, that it is not trying to be). The switch in the starting point, however, actually serves to set up the first of many important narrative shifts; the focus of the story is transferred from the Count of Monte Cristo to the anime's new protagonist, Viscount Albert de Morcerf (who plays an important role as a side character in the novel). While partying on Luna with his best buddy Franz d'Epinay, Albert finds himself in trouble with bandits, only to be saved by the Count. Before long he becomes close friends with the rich aristocrat, who ends up living in Paris, forging bonds with many of the most influential families in the city (including Albert's). But as tragedy befalls Albert's friends, acquaintances, and enemies, it becomes clear that something sinister is afoot. Some see the Count as a prime suspect, but Albert cannot believe that the man who once saved his life would be out to cause harm to him or any of his friends. The true strength of director Mahiro Maeda's (Blue Sub Six, "Second Rennaisance" portion of Animatrix) retelling lies not in simple translation. He might miss essential pieces of what Dumas was trying to say, but through these changes he creates an entirely new story, rooted in the basics of the original but not necessarily tied down to its themes or messages. Indeed, this contemporary version of The Count of Monte Cristo has its own moments of storytelling and aesthetic brilliance. Textile designer/digital director Yasufumi Soejima (Last Exile, Ristorante Paradiso) captures the opulence of Parisian aristocratic life using a fascinating and unique visual technique involving brightly colored textures that seem to remain stationary as the characters and objects they are attached to move around the frame. The effect is disorienting at first, but it lends the series a distinctive air of gaudiness that suits the setting. Meanwhile, the Count himself is the most striking image of the entire anime, with his almost vampiric blue face, pointed ears, and protruding canines. In the novel he is described as being so intriguing that he is the center of attention whenever he enters a room, so it is impressive that character designer Hidenori Matsubara (Bubblegum Crisis Tokyo 2040, Sakura Wars) was able to maintain this feature while not adhering strictly to Dumas's other descriptors. Unfortunately, Gankutsuou's anime trappings don't always work to its advantage, especially when it comes to an overuse of exposition. The original Count of Monte Cristo revels in its mystique, never making an explicit connection between the Count and Edmond Dantes (nor with his own revenge plot) until the novel's final act. In Gonzo's version, the connection is made within the first episode, and though Albert is given an incredibly wide swath of incriminating information regarding the Count, it takes him around 20 episodes to finally discover the (then quite obvious) truth. Admittedly this kind of exposition is necessary due to the omission of Dantes's back-story, but it doesn't make the dramatic irony any less frustrating. Geneon's dub doesn't exactly help matters either, with Johnny Yong Bosch's predictably overwrought performance adding a bit more intensity than necessary to Albert's character. The Count, however, finds a quietly sinister portrayal in Jamieson Price, one that I would even say fits Dumas's original version of the character. Backing up Bosch's occasionally effective performance is Ezra Weisz, mucking up nearly all of Franz's lines with mood-crushing wooden acting. Luckily, he's one of the few stinkers in the cast, but that doesn't diminish the damage Franz does to the dub version every time he's on screen. Gankutsuou's most effective moments come when Dumas and Maeda's sensibilities play off of each other. A scene of a girl suffering from poison, lit only by lightning bolts, expresses Dumas's supreme melodrama with a profound visual language not available to the author. Even scenes with sweeping changes, such as the aftermath of the duel near the end of the series, carry emotional weight thanks to Maeda's choice to continually compound his own calamitous plot threads and Dumas's own acute sense of tragedy. At its best, Gankutsuou can produce just such moments of silent collaboration between Maeda and Dumas, but in between the high points are scenes of bland anime exposition and maddening, poorly executed dramatic irony. Through it all, the series maintains a quick pace, fueled in part by Takahashi and Yamashita's propensity for cliffhanger endings in each episode, which pulled me along in much the same way that Sunrise's Code Geass did. This might not be hailed as the kind of timeless classic that its source material is, but Gankutsuou: The Count of Monte Cristo is certainly a compelling, firmly above average anime melodrama, not to be missed by any genre aficionados. This review is based on a Netflix streaming video version of the series provided by FUNimation and viewed through the reviewer's personal Netflix subscription.